My daughter turned 8 last week. We’d been planning her party for at least 1 1/2 months and frankly, I was quite tired of thinking about it! I was definitely excited for it to get underway, but when it was over, I was tremendously relieved! 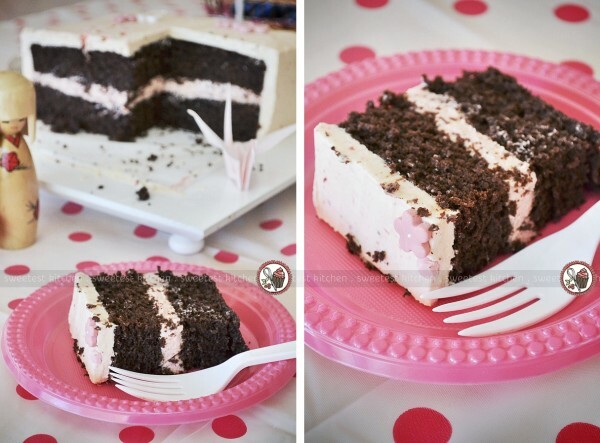 Last year, she had an ice cream party and a real show-stopper of a cake. 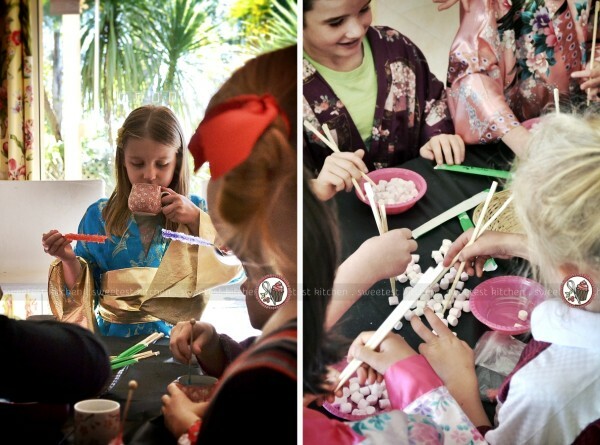 This year, she had a Japanese-themed party and the show-stopper was sweet sushi. This dish impressed the mums and was loved by my daughter and her 10 guests. It was really fun to make and so much easier than I thought. A friend of mine, Rosa, who lives in the US, offered to send me the American candy I needed to make sweet sushi – Air Heads, Fruit Roll-Ups and Swedish Fish. The “rice” is Rice Krispies treats, but I can get Rice Krispies here in Australia under a different name – Rice Bubbles. However, to make the preparation go even quicker for the sushi, I used LCM bars, which is pre-made Rice Krispies treats. Inspiration for the sweet sushi came from parents.com. To assemble, here is what I did. Working with one LCM bar/Rice Krispies treat bar at a time, place it on a baking paper-line microwave-safe plate and microwave it for 5-7 seconds. Pick up the bar and place it on a piece of plastic wrap and wrap it up lightly. Use hands to shape the bar into a shape resembling sushi. For the sashimi sushi, slightly round off the edges of the bar and slightly flatten. Unwrap the bar, cut it into 3 even-sized blocks. Using the plastic wrap again – just to keep your hands from getting too sticky – press the cut edges onto the work surface to flatten them. Use as many bars as you need to make however many sushi slices you wish. Set aside. Working with one Air Heads piece at a time, place it on a baking paper-lined microwave-safe plate and microwave it for 5-8 seconds. Make sure it’s not too hot to handle, then shape it into a slice of sashimi. If the Air Heads piece is too melty, just let it sit until it hardens up again. If you’re using the long Air Heads, you can get two slices of “sashimi” out of it. Repeat for each orange and pink (or red) Air Heads piece, and stick it on a block of “rice”. For the white stripes, microwave a white Air Heads piece, as already described, then slice it into thin slices. Shape it as per the photos and stick onto the sashimi and lightly press down to secure. Cut thin slices (see photos for examples) of Fruit Roll-Ups to wrap around the sashimi sushi. For the Swedish Fish sushi, place the warm LCM bar on its side (after it’s wrapped in plastic wrap) and flatten. Turn it vertically again and flatten. Round off the edges and continue shaping it until a Swedish Fish can sit on top without it overhanging the edges. Wrap a slice of Fruit Roll-Ups around it. For the rolled gummy worm sushi, loosely wrap the warm LCM bar in plastic wrap and flatten it gently with a rolling pin. If it starts to fall apart, you’ve rolled and flattened too much! Stick it back together if this happens. Unwrap the bar, but leave the bar on top of the plastic wrap. Place two gummy worms at the edge of the bar closest to you and trim off the overhanging pieces of worms. Using the plastic wrap, tightly, and very gently, roll the gummy worms up in the bar and when you get it rolled up, press and roll on the bar to secure it. Cut the roll, using a sharp knife and a sawing motion, into 3 slices. Using the slices as a guide, measure and cut a slice of Fruit Roll-Ups to fit around the sushi rolls. Wrap the Roll-Up around the roll and secure the edge. If your rolled sushi looks unevenly cut when you place them on a dish, lay a sheet of plastic wrap, or baking paper, on top of the sushi and stick another plate on top. Use a bag of flour/sugar/whatever to weigh it down. Leave it for a few minutes and it should even out the sushi. Store in an airtight container until ready to eat. Should keep for a couple of days. The party table, I realized later, looked a bit empty! There wasn’t much food to choose from and it lacked height. I spent too much time planning the sushi and cake, as well as activities, that I thought I didn’t have enough food. As it turned out, it was just right. 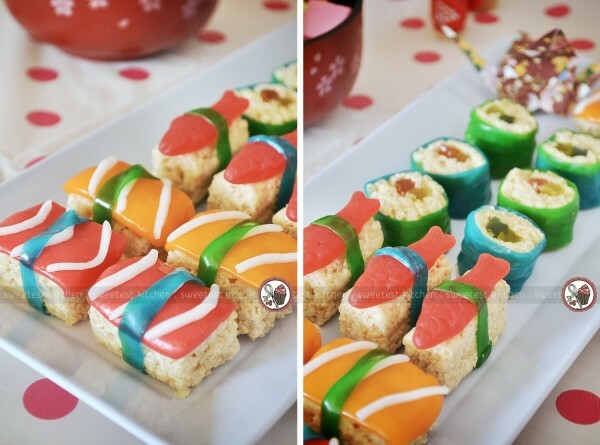 We had the candy sushi, allsorts licorice (which reminded me of sushi by the way it looks! ), the cake, sandwich sushi, rice crackers and teriyaki chicken bites (this recipe from kidspot.com.au, only I placed each chicken piece on a toothpick). 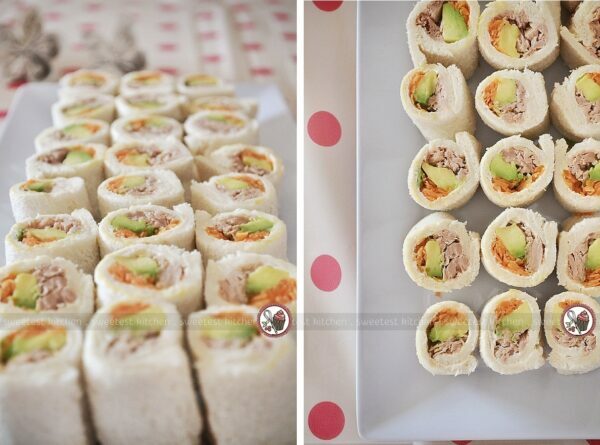 The real favorite of the girls was the sandwich sushi. I had planned to have real sushi – just a basic avocado/cucumber sushi – but at the last minute I decided to go with a less traditional sushi. I wasn’t sure how many of the girls actually liked real sushi (turns out that most do like real sushi – they’re obviously not from a cornfield in Indiana!) so while sticking with a sushi theme, I chose some more familiar ingredients – bread, cream cheese, tuna, avocado and carrot. Slightly quicker, slightly more kid-friendly but just as delicious! The girls loved it! 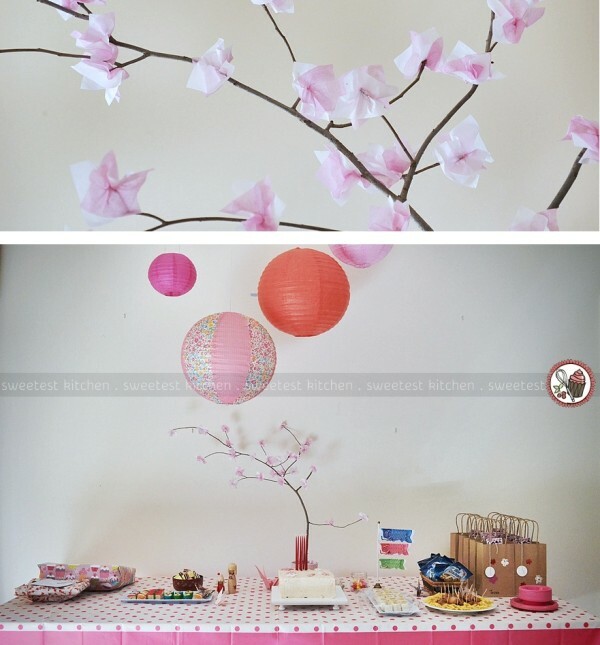 The main centerpiece of the table was a tissue paper cherry blossom branch. This is simply a tree branch cut from a tree in our yard with pink and white tissue paper glued on! Here is a tutorial from Designed Decor, but I just allowed myself time to cut out squares of tissue paper, stack a piece of white on top of pink (and vice versa) and scrunch the paper in the middle. A lot of our decorations came from Daiso Japan in Chatswood. That shop is brilliant. Everything Japanese. Everything $2.80. The party bags are just brown Kraft paper bags. We bought them plain and my daughter used apple stamps in the shapes of cherry blossoms (yes, this was tricky to cut out of apples!). 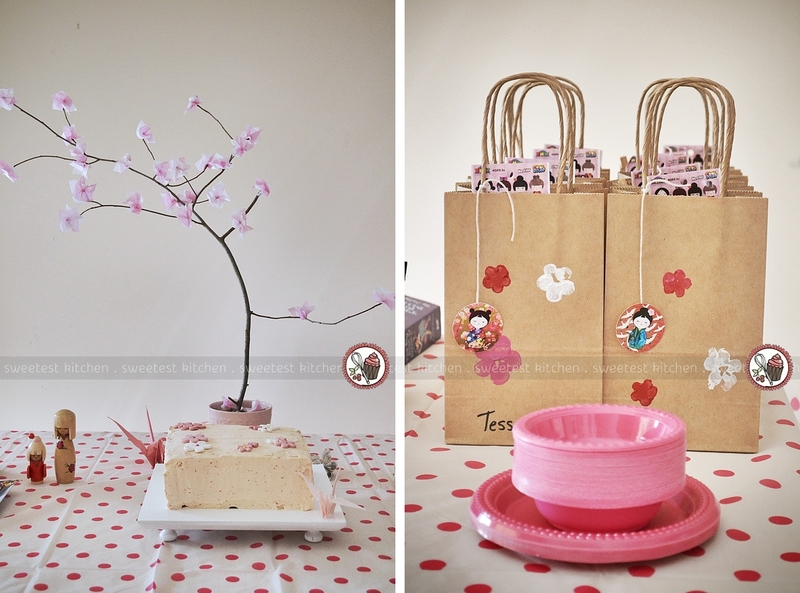 The invitations and party bags matched – apple stamp cherry blossoms on Kraft paper. Inside the party bags was an assortment of Japanese-themed stuff. The kokeshi doll circles hanging from the bag were from a craft I had planned, but the supplies didn’t arrive in time by mail so I had to scrap that idea! 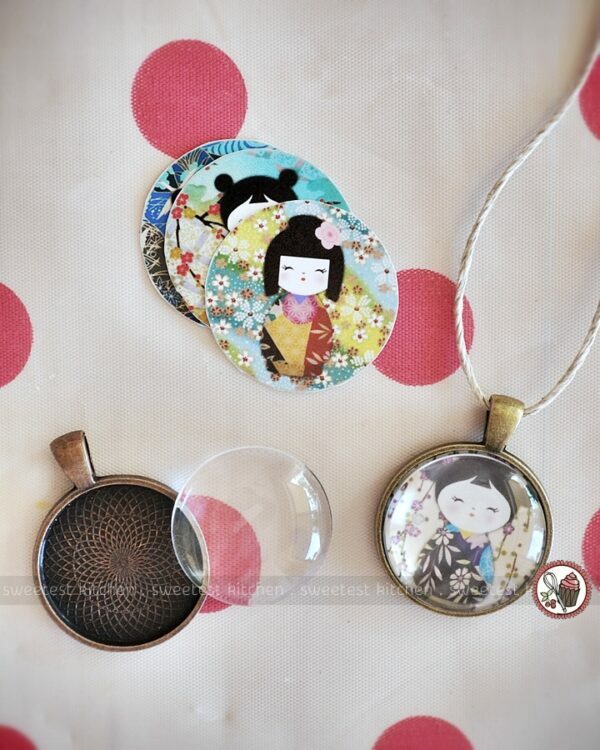 I had purchased these Japanese doll digital collage sheets (from Art Cult on Etsy) to cut out and for the girls to place into these pendants with glass domes (from DewSupplies on Etsy) to make necklaces. But it took 7 working days for the pendants to arrive from Melbourne to Sydney! Outrageous! So I told the girls that Emma and I would make the necklaces and bring them to school to hand out instead. I used some of the circles to hang on the party bags. I actually had to cut the 1-inch prints even more to fit inside the pendants, though! But doesn’t it look cute! For activities/games, we had a tea ceremony with Japanese music (purchased from iTunes), an origami session and learning how to use chopsticks by practicing picking up marshmallows. And yes, most of the girls wore kimonos! They looked fantastic! The tea was hibiscus/lemon/apple juice tea; a recipe from Martha Stewart. The origami pieces we made were these finger puppets, water balloons and boats. I had a couple more origami things planned, but we didn’t end up having time. The inspiration for picking up mini marshmallows with chopsticks came from Restless Risa. 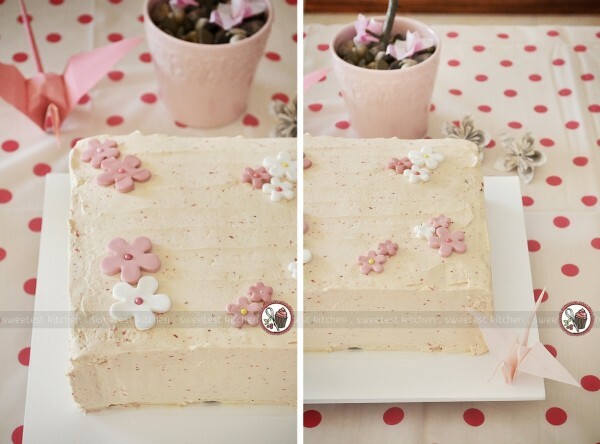 The “cherry blossom” birthday cake was inspired by Martha Stewart. It was delicious!!! To save time, I used 2 chocolate cake box mixes. The filling and frosting is as per Marta Stewart’s original recipe. The cake is 2 layers, filled with strawberry (“cherry blossom”!) cream cheese filling and frosted with strawberry (“cherry blossom”!) Swiss meringue buttercream. I cut both recipes in half, however, because my cake was 2 layers instead of the original 3. I used a scant 1/4 cup of strawberry puree in the frosting because I didn’t want the frosting to be too pink. The cherry blossoms were cut from Bakels Pettinice white fondant, and colored pink with Wilton’s gel food coloring. We placed pink, yellow and white cauchous in the middle of the blossoms. The candles were red. It was so delicious! I froze the leftover cake and we’re still nibbling on slices, a week later! So, the girls all had a great time, despite all my stressing about there perhaps not being enough food and the pendants not arriving in time! This party theme was a little bit out of the ordinary, but very fun. What’s the strangest/most unique birthday party you’ve planned/been to? So cute! 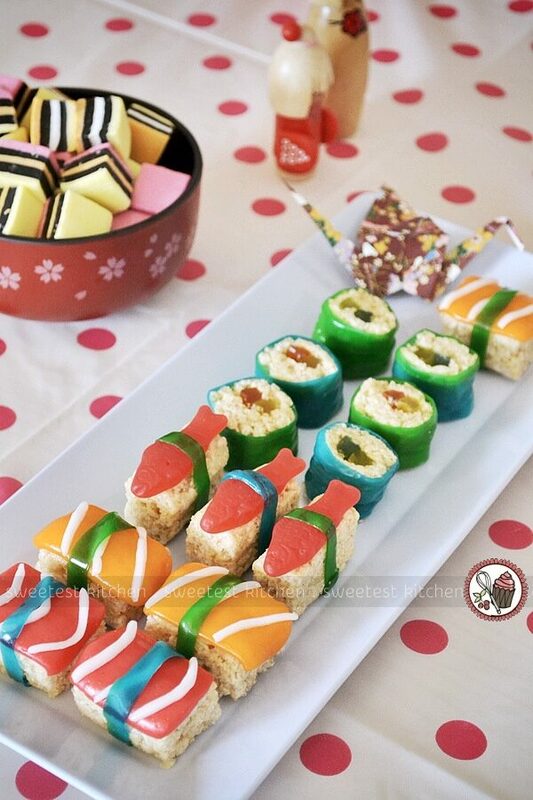 I love the idea of candy sushi. And the cake looks magical. I am ready to take a big bite out of the screen. 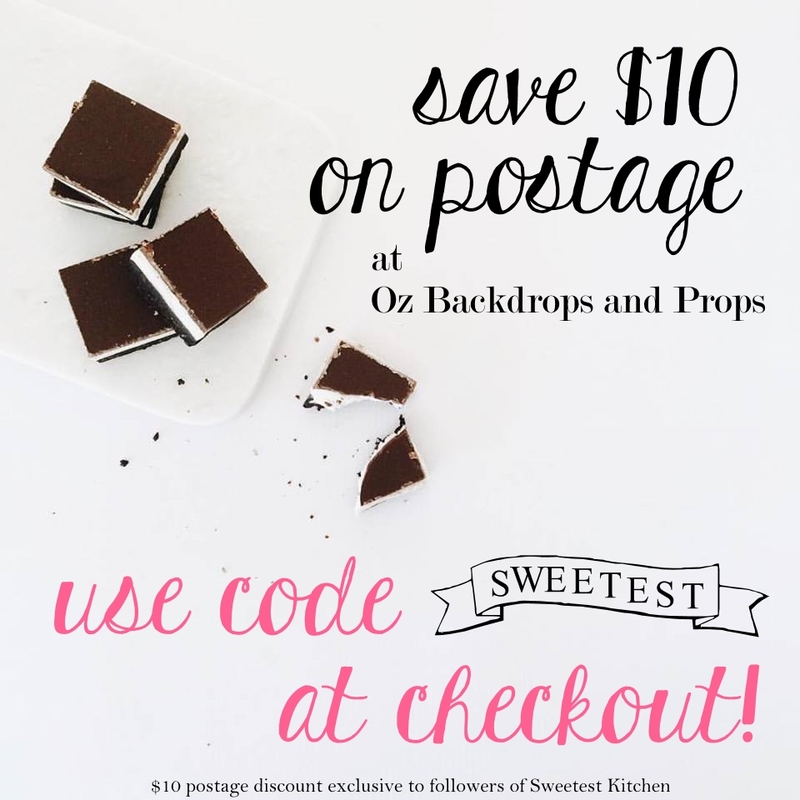 Love your party ideas! I’m doing a presentation on Japan for a class, so this is just perfect! I can’t afford sushi for 30 students, so sweet sushi will do! 🙂 Thank you from Los Angeles, Ca! I love this! I’m doing a Japan party for my daughter so this is so great!!! Where did you get the kiminos? Hi Melissa, all of the party guests brought their own kimonos, and honestly, some of them were just dressing gowns/silk robes that had Asian-inspired designs. Our blue & gold one came from a shop here in Sydney, but I’m not sure where as it was a gift from my mother-in-law. I’m sorry I’m not very helpful, I even had a look myself to supply for the guests who didn’t have any, but I didn’t have much luck and the ones I did find were too expensive. The only advice I can offer is possibly have a look at costume/dress-up shops, or try searching for kids kimonos on google. Thanks for sharing your ideas and talents. I am trying do a Japanese themed party for my niece, your post will really help me. What type of food coloring did you use for the blue / green / orange colors and how did you get different colours to look so nice on sushi? Where did you get the kimonos?